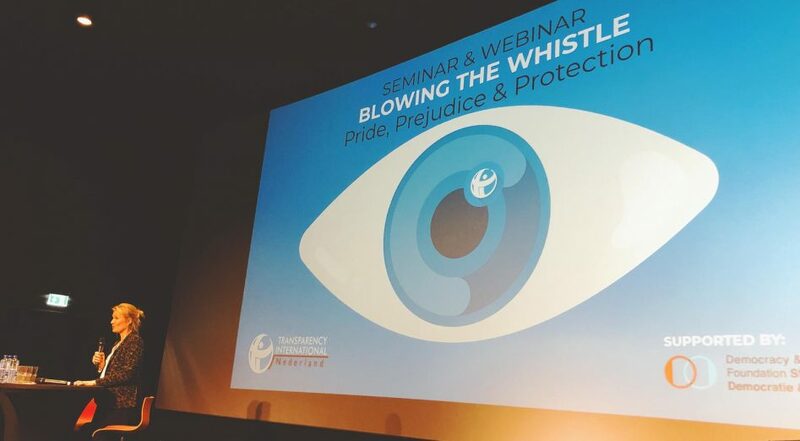 Utrecht, 30 november 2018 – Transparency International Nederland would like to thank everyone that joined the important conversation on the need to speak up at our Seminar & Webinar Blowing the Whistle: Pride, Prejudice & Protection, taking place yesterday. With international, thought-provoking speakers, more than 70 interested attendees at the seminar and participants from 16 different countries around the world joining the webinar, there was a high level of interest and engagement from the audience. Whistleblowing is not something that you choose for or aspire but I rather battle with fear than to live with shame and regret, Wendy Addison answered in reply to the question why she decided to blow the whistle despite of the threats she received. Endowed professor of behavior and performance management Michaela Schippers underlines that it is relatively easy to shut people up but really challenging to make people interact and to create some kind of psychological safety. What makes it so hard is the social pressure not to speak up. “We all want to fit in. People who get into a group organisation want to keep each other happy and find loyalty very important”. However, there is a paradox here: we do value speaking up but in reality people want to avoid being asked difficult questions. Creating psychological safety is proven to be the most important factor to create a succesfull team that is able to bounce ideas off each other, strengthen action plans and help to solve issues and provide support. Psychological safety is a belief that one will not be punished or humiliated for speaking up with ideas, questions, concerns or mistakes. Richard Bistrong pleaded guilty and was sentenced to one count of Conspiracy to violate the FCPA. He is very clear on the fact that he is only blaming himself for what happened but underscores that business leadership do carry the responsibility to prepare people for the risk they face in their work environment before they are in the middle of it. If the question was asked it might have not happened in the first place. Ethics, honesty, integrity and responsibility sound louder when they come through the voice of business. Share and prepare people for the risks before they are in the middle, Bistrong says. The complete contributions of our speakers will be published shortly on www.transparency.nl.